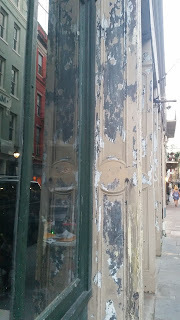 DEBORAH CROMBIE: Hi from NOLA! I arrived on Tuesday, a few days early for Bouchercon 2016, Blood on the Bayou, (what a great name for the best and biggest mystery conference of the year) which officially started yesterday afternoon. Just in case we haven't already told you, a bunch of mystery writers get together with a bunch of mystery readers for three and a half days of panels and events...and parties. If crime writers know anything, it's how to have a good time. So, Debs isn't writing, you say. But I am, actually. 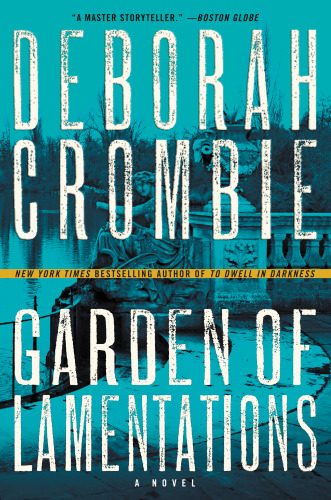 I'm working on the copy edit for GARDEN OF LAMENTATIONS, which must be finished by the middle of next week, and it's been great. I've spent my mornings working in blissful quiet in my room, and my afternoons and evenings exploring the French Quarter. 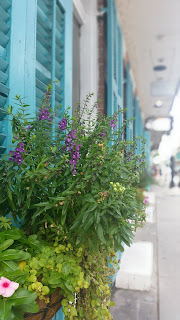 I hadn't been to New Orleans since my teens and I am loving this city. You can see why it fires the imaginations of writers and artists and musicians. 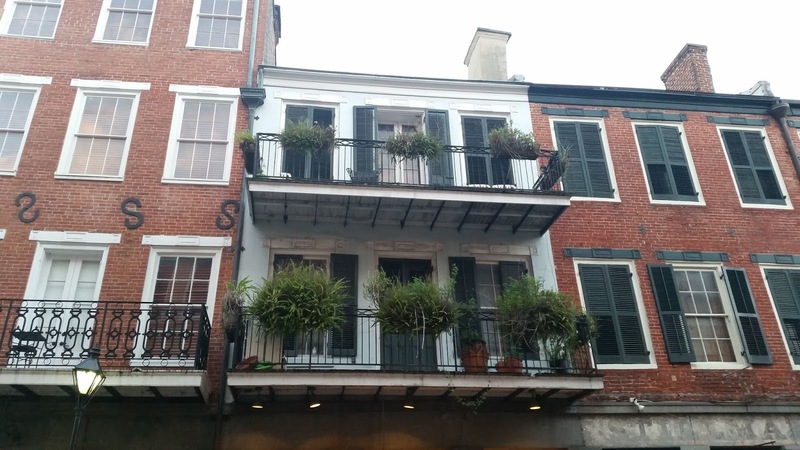 I want to sit on this balcony and watch New Orleans go by! And I haven't even mentioned food. Another day. Susan and Hank and Rhys are here, too, and we've managed to wave across the throngs. We are hoping to at least meet up for a drink. READERS, how do you feel about NOLA? New Orleans is such an interesting city. 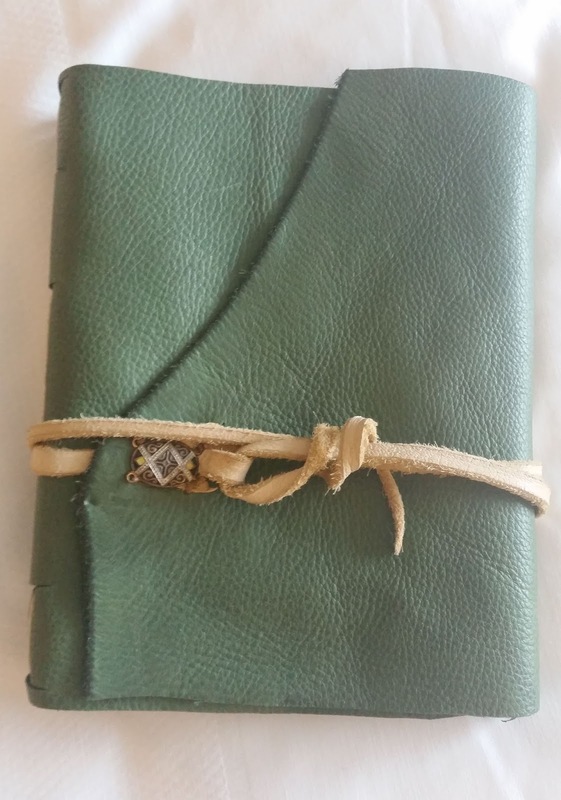 Your journal is lovely . . . a paper shop has to be a special treat! I’m sure everyone will have a wonderful time, especially at all the Bouchercon doings . . . .
Name of the conference “Bouchercon - Blood on the Bayou” is the best and biggest mystery title of conference in which group of mystery writers catch together with a bunch of mystery readers for three and a half days of panels, events and parties. Being as apart of education and as assignment writer or assignment help services provider, I love to attend such kind of conference. But I never before being a part of mystery conference, so I am very excited to be a part of it as well as told about it with my professional team members of experts assignment writers at Secure Assignment Help. Being as a personal statement writer, I am very happy and it’s wonderful to meet here smart and sassy crime fiction writers who are also jungle red writers. One of my friend who is also provide UCAS personal statement writing services with me at Personal Statement Folks suggest me this website which is really awesome and encourage me as I am also a part of writing. 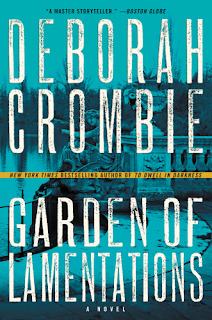 And it is my pleasure to read about best and biggest mystery conference “DEBORAH CROMBIE”. I am bookmarking this beneficial site and definitely come back here to get new knowledgeable information. Sounds like a win-win already--time for work AND play! Love, love, love NOLA! Love the sense of place, the sense of history, the vivacity, the food--and yes, beignets and hot chocolate at midnight at Cafe du Monde. Strolling, watching the river, watching the people, browsing in the shops, discovering something new every time I go. If y'all catch a sense of someone near, that's me--I'm with you in spirit! I haven't heard of the conference like this , but after reading this article I would definitely visit the same because I am a great fan of detective books. Thanks a lot for it! I was delighted to grab a hug with you last night, and have also greeted Hank and Rhys. Having a splendid time, myself - I also came early to do some exploring. Love the immersion in lush air, hidden gardens, a slow pace of life, even a glimpse of the underside. I am envious on a cellular level. NOLA was a temporary home when I was in grad school and I miss it outrageously. The quarter is lovely but make sure to get uptown as well. If you can, wander the riverwalk near the zoo and Audubon park. There are bridges where you can sit and watch the big muddy meander past. Oh, I so wish I were there. I love the food, the music, the people, the architecture. I love that when you're there you know you're somewhere special as opposed to any-mall USA. Haven't been to NOLA some the mid-eighties and envy you being there. May just go cook up a pot of red beans and rice in commemoration Have fun, stay pure, and hope to see you next month when we are in McKinney. Oct 17, a Monday I think. 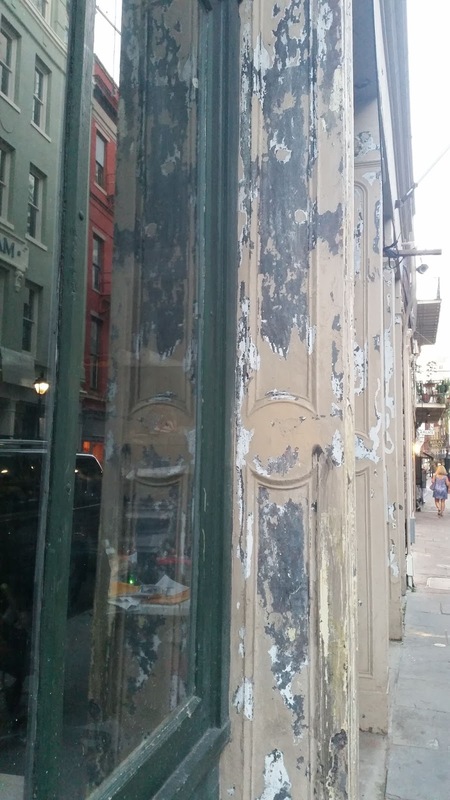 The first thing that popped in my mind when you asked "What do you think of NOLA?" was "I think the city should be relocated." The whole city is only 5 feet max above sea level. With Climate change the oceans are predicted to rise 2 meters (about 7 feet) in the next 50 years. By 2060 New Orleans and Miami may well be underwater. And, the color, the history, the streetcars the sense of place will be gone. I love visiting this city, hearing the very different southern dialect, feeling like years of "les bon temp rouler" have settled into the bricks. Now I am sounding like Cassandra so it is time to close. Enjoy NOLA she has something for everyone. I like to think it's partly in my genes -- my mother was born and raised just south of Baton Rouge, so I certainly feel some personal connection to the region. But my love for NOLA is so much more than that. I love that it's so bawdy and outrageous, but also genteel and beautiful. The city is totally self aware, too. NOLA will give you the finger, but with such a sly smile that you can't help smiling back. On my 25th wedding anniversary, I joined my husband for a conference he was attending in NOLA. We stayed at the Roosevelt Hotel, and apparently, though he forgot ever having done so, he mentioned in passing that he was booking beyond the end of the conference because we were staying to celebrate our anniversary. When we checked in, they upgraded us to what is probably the nicest suite I have ever stayed in! It was a glorious visit. Wonderful photos! 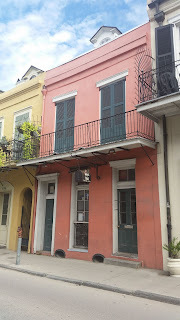 I haven't been to NOLA since I was in college - that was in the early 1970s, and I went for Mardi Gras so I can't claim to have seen much except for crowds. 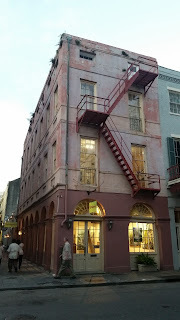 I did have the great good luck to stay with friends who had a house--yes, a house-- in the French Quarter. I always promised myself I would go back..haven't made it yet. Have a double great time and keep the photos coming! 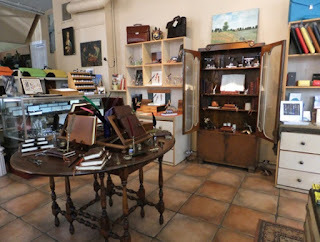 Debs, I love that you and others, writers and readers, take off for New Orleans. Great photos! 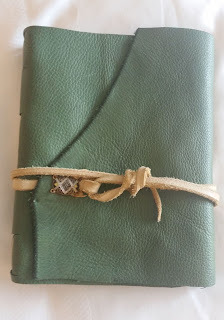 The most beautiful journal I've ever seen! And Harry Potter-ish stuff? I'm drooling all over my keyboard. It looks and sounds exciting and full of new images. How much better could it be for creatives? Love that you and the others are there! Everyone will benefit! Until a couple of weeks ago, I never thought that I could attend such an event. next year I want to participate and to meet my favorites writers and bloggers. Debs, the tea with you and Caroline Todd and Charles Todd today was one of the best parts of Bouchercon New Orleans. It was wonderful to hear the three of you talk! Talking with Susan and Rhys and seeing Hank briefly was wonderful, too!